This straightforward, comprehensive guide to the legal rights of children and young people with special educational needs includes all the most recent developments in law, and clearly explains the key issues in a complex system. Helping parents to understand the legal entitlements of their child, Nettleton and Friel explain the new Education, Health and Care Plans which have replaced the Statements of Special Educational Needs. They explain what an Education, Health and Care Plan is, how assessments are carried out, and how annual reviews, amendments, rights of appeal and tribunals work in practice. They also include help with 25 of the most common problems encountered, a discussion of relevant cases, extracts from the official published guidance issued, and a draft Reasons for Appeal. This essential handbook for parents of children with special educational needs will also be a key reference for teachers, charities, Local Authority officers, and lawyers in other fields. 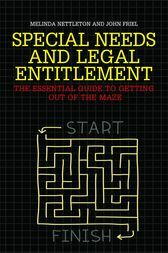 This book is a disciplined read but one that is essential for anyone trying to make sense of the complexities of litigation and special educational needs... Clear guidance via a comparison of the previous system to the current system is a central theme of the book. This includes details as to how a statutory assessment for an EHC plan works; how the Code of Practice works and how the system provides for parents who are requesting an EHC plan plus how to make an appeal. Melinda Nettleton is the founding member and Principal Solicitor of SEN Legal and a Trustee of HACS (Hillingdon Autistic Care and Support). She is the mother of three children, one of whom has Special Educational Needs. She divides her time between London and Bury St Edmunds, UK. John Friel is a barrister at Hardwicke with expertise in public law issues. He has won leading cases in the House of Lords, Court of Appeal, and High Court, and is featured in The Legal 500 and Chambers UK as an Education Law specialist. He is the author of Young Adults with Special Needs: Assessment, Law and Practice - Caught in the Acts, also published by Jessica Kingsley Publishers, and is based in London, UK.